I did not do a lot this growing season. I planted garlic last fall and recently pulled that from the ground. But I planted no garden. I never picked strawberries of blueberries. We had no farm share this year. Granted, we were away much of the summer, but still, I put up little. I was no gardener or gatherer. We did manage to get out to pick apples at least. We picked lots of them, many varieties, from Shelburne Orchards, our favorite orchard. The view alone from that place makes a visit worth it. I have made apple crisp a couple of times, and have enough apples left to make one more. And last weekend I made apple jam. Blueberry and strawberry and other berry jams get all the publicity. They are good no doubt. Huckleberry or marionberry jam can fill the mouth with deliciousness that is hard to beat. But these past few years my favorite jam has been made with apples. We have an apple tree at our house but it has been unhealthy and bears little fruit now. When it did offer up fruit I made the best jam ever. Those apples are Red Delicious, your classic apple. I have not liked those kinds of apples typically. They are usually mealy, lacking flavor, with tough skins. They hold up well and can be transported without too much damage but that shelf life takes its toll on tastiness. Red Delicious certainly are red–they usually look great in a pile at the supermarket–but they are anything but delicious. The ones from our tree, however, are some of the best apples I have ever had. When I first tasted a ripe one I understood why the variety became so popular. Unfortunately, that popularity has been costly. 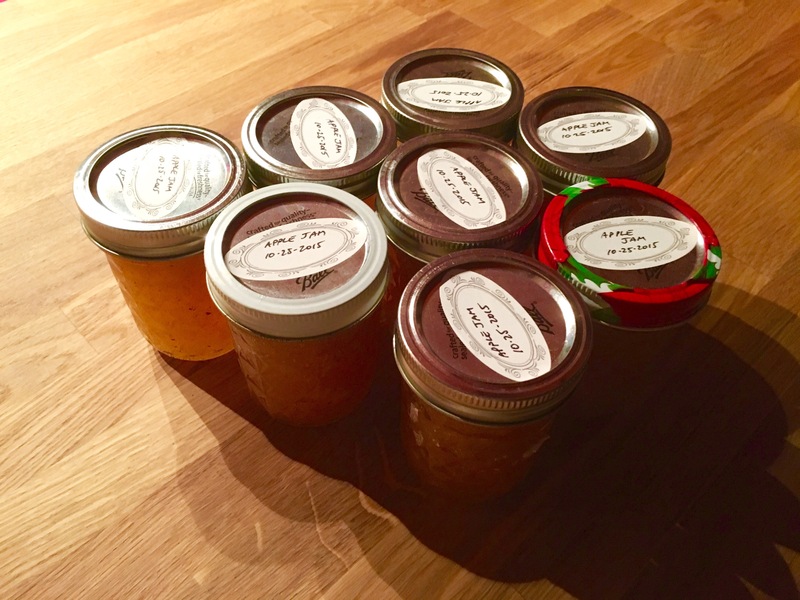 My jam is pretty simple–apples, sugar, lemon juice, pectin, some nutmeg. With good apples it is a sweet treat that makes a mean PB and J, if you know what I’m saying. I took a couple of hours to rustle up eight jars. They are still sitting on the counter, waiting to be stored. That growing season lethargy continues, I guess. I have a jar left from last season and will polish that off soon. Then I will taste this season’s batch. I have no doubt it will be good, and it will last into the winter. I have no potatoes or onions or frozen pumpkin this year, but I do at least have some apple jam. It won’t make a meal but it will remind me of the days when blossoms filled the air with their almost supernatural scent, and of bees, and of fruit heavy on branches. Maybe next year I will be better at taking advantage of the short growing season, of the wonder of fresh food grown myself, or grown by my neighbors. For now, however, I’ll have to settle for some toast. This entry was posted in food, gardening, Local and tagged apple jam, apples, canning, fall, garden, jam, red delicious, Shelburne Orchards. Bookmark the permalink.